"...The Plan Check name and brand stem from its location, adjacent to the Building and Safety Department, where hundreds of Architects, Developers, Designers and Engineers flock daily to get plans reviewed for permitting. It embodies the architectural/creative lifestyle and the culture that surrounds it, effortlessly blending vintage architectural office elements with industrial pieces, rich materials and a warm atmosphere.."
Street parking or valet service in the evenings were both convenient. The Marinater and I sought out the cheeseburgers at Plan Check, because this was the new project of chef Ernesto Uchimura. Chef Unchimura was the former Executive Chef at Umami Burger...back before it expanded beyond its ability to maintain standards and went from amazing to merely good. We had high hopes for the Plan Check burger offerings, since the chef had created a world-class burger once before. We ordered both the eponymous PC Burger and the Chef's Favorite Burger. The PC (Plan Check) Burger ($10) was an assemblage of akaushi red Wagyu beef, Americanized dashi cheese, ketchup leather, schmaltz onions, mixed pickles, and a crunch bun. 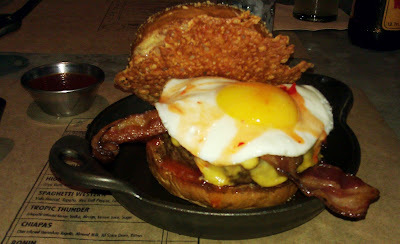 The Chefs Favorite Burger ($12) came with the same beef, cheese two ways, bacon two ways, ketchup leather, sunny fried egg, hot sauce, on a crunch bun. Our wait was less than 15 minutes until our order arrived at the table. The Beef: Plan Check used a 50/50 blend of wet-aged, Waygu Chuck and Short Rib. The beef was delivered by Newport Meats. The 6-ounce patties were intensely flavorful. The beefiness was what one noticed first. From there, a mild funk from the aging settled in. As the bite progressed, I noted mineral notes from the blood and Short Rib. The fat content was at about 30%, but the burger was not greasy. It was perfectly juicy, though. The bite was tender and the grind was coarse enough to allow one to savor each bite long enough to really savor the complex flavors of both the beef and the assorted toppings. The beef was really just fantastic. It tasted like Umami Burger used to taste but without the obvious trickery of the addition of umami flavorings. This was honest, excellent, high-quality, burger meat. The Seasoning: On the PC Burger, I picked up a tight blend of salt and pepper. There really is nothing better than simple salt and pepper to make beef pop. The seasoning blend at Plan Check truly made the beef pop. In the case of the Chefs Favorite Burger, there was something oppressively salty already on the burger. The additional salt from the seasoning was not a blessing. The Sear: Yes, yes, a thousand times, yes. The griddled sear was dark and crisp. The high fat content and intense cooking temperature both lent themselves nicely to the generation of that perfect sear. The Preparation: We ordered Med-Rare, and Med-Rare is what arrived at the table. The burger patties at Plan Check were hand-formed during the prep cycle. The beef was ground in-house to a medium-coarse setting. 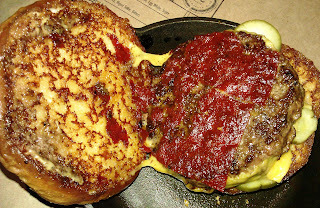 The patties were formed with gentle and appropriate pressure to create a perfect burger patty. The Cheese: The Americanized Dashi cheese was reminiscent of the cheese on the Umami SoCal burger. It was dairy treated with sodium citrate. The reaction caused the dairy to firm up. The addition of dashinomoto (bonito flakes/powder) provided the umami component of the flavor profile. The cheese was creamy and flavorful. The Bun: On the night that we tried the burgers, Plan Check was experimenting with a bespoke cheese and truffle bun from a local bakery. The pillowy, moist, fresh bun was mildly yeasty and barely sweet. The exterior of the bun was peppered with crunchy bits of cheese. This, combined with the thorough toasting of the bun, created a pleasing crunchiness in every bite. The Toppings: Honestly, it was a blur. The PC Burger was so damn good that the ketchup leather, schmaltz onions, and mixed pickles sort of got lost in the background. These ingredients did contribute some sweet and sour notes, but they were quiet notes. The ketchup leather was particularly smart. It provided the flavors of ketchup without the unwanted additional moisture. One of the toppings, presumably the bacon, was far too salty for the dish. As a result, we had to take the Chefs Favorite Burger apart to enjoy it. The sunny side up egg on this burger was fun. The runny yolk provided a creaminess, which was very enjoyable. The Fries: Hooray! The fries were cooked in a combination of vegetable oil and beef tallow. Beef tallow is what made MacDonalds fries taste so darned good. After the uproar over cooking with beef fat, MacDonalds shifted to using a beef extract. Finally, the threw in the towel and stopped adding any sort of beef to the fries....sadness. Happily, Plan Check picked up the baton. The fries were simple better than regular fries. The hand-cut fries were crisp, properly seasoned, and very flavorful. I don't ordinarily sing the praises of ketchup, but Plan Check made their own ketchup, and it was a revelation. The ketchup was light on the acid and very heavy on the fresh tomato flavors. The ketchup resembled a pureed gazpacho. It tasted like a garden--it was fantastic. The Value: Two cheeseburgers, two soft drinks, and a side of fries came out to about $43 bucks at Plan Check. The food was absolutely exceptional. The value was average. Again, the food was exceptional. Plan Check had a nice menu apart from the burgers, but when I return, it will be with more friends, and it will be to have the PC Burger again. Burger Review : If you liked Umami Burger back when it was good, you will absolutely love Plan Check. 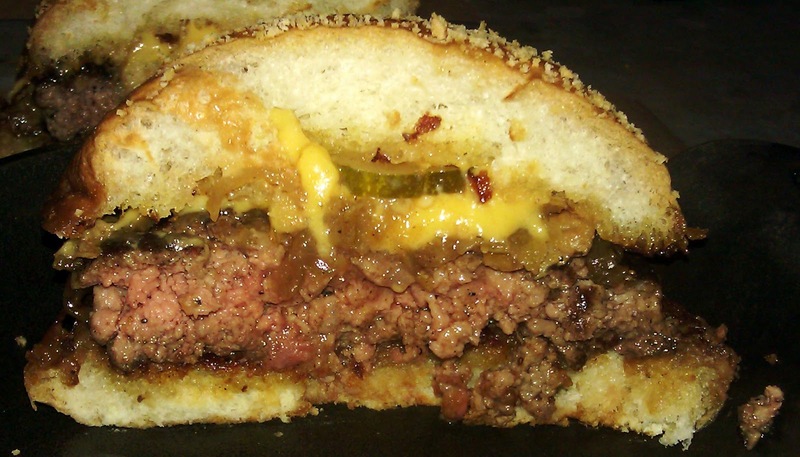 Plan Check cheeseburgers were better, because they were simply more honest than Umami's burgers. Try the fried chicken if you get the chance. A bit steep at $13, but it is sublime. Once again, thanks for the recommendation.